Cancun and Cancun Great Vacations will join 92 countries in a pledge to turn off our lights on March 27 at 8:30PM local time in support of Earth Hour 2010 to help bring awareness to climate change. 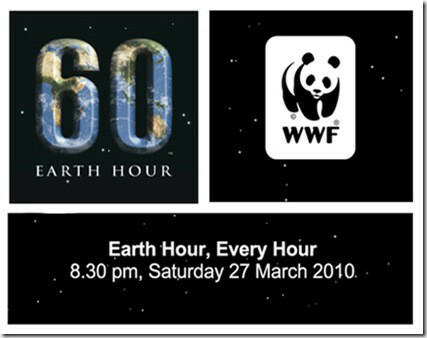 Earth Hour is the world’s largest global climate change initiative with over 92 countries and 1,100 cities participating. The main goal is to create a network of individuals, corporations, and governments to address climate change and create solutions on a global level. It is also a starting point for individuals to make long-lasting behavioral changes into a more eco-friendly lifestyle. This is how Earth looks like with all the lights on. Let’s join and turn the lights off for one hour. Cancun’s society and government will also host a public event on Earth Hour in Plaza Forum by the Sea on Blvd. Kukulkan KM. 9.7 in the hotel zone. Cancun is one of the most important tourist destinations in Latin America, bringing with its popularity an influx of consequences with regards to climate change. This popularity also places Cancun as the perfect setting to bring awareness to the sustainability of the environment. Mexico becomes even more significant as Cancun will be the headquarters for The 16th Session of the Conference of the Parties to the United Nations Framework Convention on Climate Change in November 2010. The Convention on Climate Change along with Earth Hour 2010 will serve to take concrete actions to confront one of the most urgent challenges for humans and the environment. Cancun Great Vacations wants to invite you to participate in this important event along with us and make your Earth Hour 2010 pledge. If you want more information, visit the WWF’s Earth Hour website.